Two sisters traded their pens for new apron strings, and found success in the food business. An alumnus transformed a run-down diner in San Antonio into a culinary hot spot. Two graduates brought the century-old heritage of Central Texas barbecue to Big D. This is a story of Austin College alumni who are living life by the drop … and the bite. 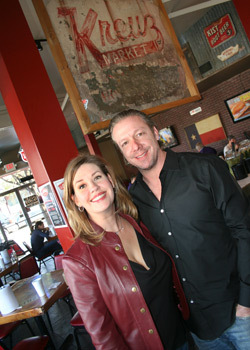 Jeff Bergus ’88 met Jill Grobowsky ’95 at an Austin College Homecoming; sparks flew and the two were married. Jeff already was a jet-setting executive in the design world, representing brands such as Geoffrey Beene and Izod. His fashion sense and the business lessons learned at Austin College were put to the test as he plied his trade in Europe, New York City, and Hong Kong. Jill, who completed a degree in communications, embarked on a career that encompassed corporate public relations as well as journalism at esteemed news network CNN. Yet, as their family grew with the arrival of children, Jeff and Jill wanted to settle down close to their Texas home. Drawing inspiration from Jill’s family roots in barbecue, an idea was hatched. She is closely related to the original Schmidt of Smitty’s and Kreuz fame, two legendary meat markets in the Texas Hill Country and among the elite of barbecue in America. Jill’s grandmother, a matron of legendary Texas barbecue, is more than 100 years old, an accomplishment that Jill says the family credits entirely to barbecue. An hour-long dinner at any of the family’s dining institutions will leave a lingering, intoxicating smell of barbecue with diners. “And even when I go to the bank,” Jill says, “they always tell me my money smells like barbecue.” For these alumni, that’s the smell of success. With Jill’s extensive marketing experience, Jeff’s success in the business of fashion and design, and the family’s pedigree in barbecue, a logical step for the couple was into the culinary world. Once word spread in Dallas that the granddaughter of the man who owned the legendary Kreuz Market was working on a barbecue joint in the Metroplex, the buzz reached a fever pitch. Jeff spent months obsessing over the finer details of making their restaurant, Lockhart Smokehouse, something one would find in the middle of the Taylor-Elgin-Lockhart triangle in central Texas known as the Barbecue Trail. Completed in February 2011, the new restaurant in Dallas’ Bishop Arts District certainly looks the part. Patrons cue up in a long hallway full of eclectic knick-knacks, leading to the intoxicating aroma of the wood smoke and tender brisket coming from the fire pit. At the counter, a customer can see the giant butcher block full of smoked meat of all kinds just pulled from the hot coals. An order comes in, a hunk of meat is cut away and served with beans, pickles, onions, or whatever tickles the customer’s fancy. And, proudly displayed in the dining room is the original Kreuz Market sign that hung in the Lockhart, Texas, location for so many years. In homage to the Central Texas original, Lockhart Smokehouse is the exclusive Dallas purveyor of Kreuz Market sausages, named among the best sausage in America in a number of esteemed culinary lists. This nod to heritage shows the respect the Bergus couple has for where barbecue has come and the business savvy that will carry their craft into the future. 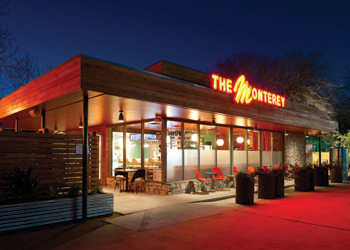 “Austin College gave me the confidence to be singular, to do things in life with a point of view,” said Chad Carey ’99, as he prepared lunch at his highly-praised restaurant in San Antonio, The Monterey. In the third year of operation of one of a handful of Central Texas hot spots that garner national attention, Chad reflects on his path from his hometown of Bowie, Texas, to the halls of Austin College, and on to success in the culinary industry. In middle school and high school, Chad had been exposed to Austin College through summer camps on campus. Once he had the chance enroll, he dove into his education, completing a major in communication arts and playing football for the Kangaroos. After graduating, Chad found his way into real estate development. He married his college sweetheart Kate Currie ’00, and the two put down roots in San Antonio. Driving through San Antonio’s vibrant King William neighborhood, Chad spotted a run-down diner, a gas station in its former life. Drawing on his “foodie” inspirations, Carey said he knew then the kind of restaurant he wanted to open. After a year of design and extensive rehabilitation, The Monterey was born. The menu, Carey said, is “bereft of a defined standard.” It could be called fine dining. Then, one also could order a cold can of Pearl beer with beef bathed in bone marrow butter. They cook with all the parts, from nose to tail, the root, and the greens. Most everything served in Carey’s restaurant comes from local farmers and purveyors. But one thing is certain, Carey said; they are not pretentious. “We don’t take food too seriously,” he added. Numerous national awards bring a humble brag here and there from Chad. But it’s pure happiness he exudes telling the story of being at the airport when a fan noticed his Monterey T-shirt and identified it as his favorite place in San Antonio. “Because happiness breeds our hospitality, it really feels good,” Chad said. Two sisters have put their mark on the culinary world, quite literally, with cookbooks, blogs, and writings of all nature. 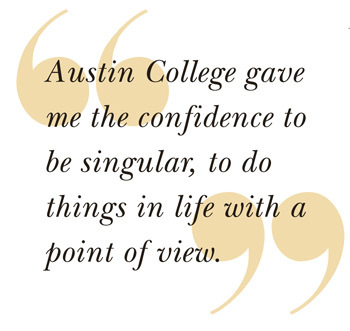 Rebecca Withers Chastenet ’88 and Katherine Withers Cobbs ’91—daughters of John Ed and Jean Eberts Withers, both ’61—say Austin College is where they honed their writing skills and developed the critical thinking skills that led to their lives in publishing and the culinary arts. Rebecca traded her pen for apron strings with the opening of Slurp, her successful Airstream Eatery in Santa Fe, New Mexico, that won accolades from local critics and appeared in Airstream Life and Sunset magazines. A restaurant critic and food writer for more than 15 years, Rebecca wrote regular food features for regional and international publications, and co-authored four cookbooks, collaborating with chefs and caterers who preferred cooking to writing. She was published widely under the name Rebecca Chastenet de Gery. On the streets of downtown Santa Fe, the smell of home cooking beckons one toward the aroma coming from an unusual source. Just west of the New Mexico Capitol, in a refurbished 1967 Airstream trailer that she calls a symbol of culinary freedom and soup sovereignty, Rebecca operates one of the city’s first-ever food trucks, which she and her partners lovingly call Slurp. The dedicated work of operating a food truck starts at the crack of dawn, as focaccia bread starts baking at 5:30, and soup preparation begins around 7:30. On any given day, more than 12 gallons of soup are prepared, and there’s always a vegetarian offering. At least 15 different soups a week make the final cut for the menu. The masses get word of Slurp’s daily offerings via social media. Rebecca’s soul satisfying work is matched only by the appetite-satisfying bowls of joy she serves. Update: Slurp has transitioned into a new writing and business adventure for Rebecca at urbanpopups.com. The international blogging and social media effort chronicles the fast-growing popup culture movement. She has other projects in the works—and continues her “greatest job” of raising her three children—two high-school-aged daughters and a 9-year-old son—at home with her husband in Santa Fe. 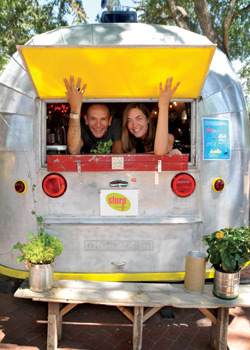 Rebecca Chastenet and her crew provide daily offerings at her Airstream eatery. Photo by Jennifer Esperanza. Rebecca’s sister Katherine graduated from Austin College in 1991, moved to Washington, D.C., and worked as an event planner at the Smithsonian Institution. She later moved to France for six months to work the grape harvest in the Bordeaux region and to sow her oats through travel. Returning stateside, she took a job at National Geographic Magazine. After several years in the publishing industry, Katherine left D.C. to work for a small publisher of photojournalism books in Sausalito, California. That blossomed into a job as an editor for the Williams-Sonoma brand. Today, Katherine is contributing editor for the book division of Time Inc., tasked with bringing in new talent and concepts for lifestyle brands including Cooking Light, Southern Living, Sunset, Health, and Food & Wine. 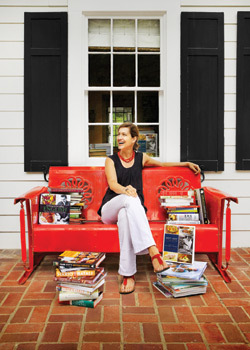 Katherine Cobbs pauses amid many of her cookbooks. Photo by Major Colbert. ’Roo successes are everywhere and culinary endeavors are no exception. The Homesick Texan, Lisa Fain, continues to gain acclaim for her recipes and blog from New York. El Corazon de Tejas was launched this spring in Dallas by John and Susan DeLee Cuellar ’69 (a name famous for Mexican food). Who are other ’Roos making a mark on The Business of Food? Send “food” news to editor@austincollege.edu.